Save thousands on this stunning 2017 Jaguar XE 35t Premium sport sedan currently available at Jaguar Colorado Springs. This beautiful Approved Certified Pre-Owned Jaguar was part of our courtesy program so it was well-maintained by our Jaguar service experts. The best part is you save a lot on this gently-used vehicle! Powered by a responsive supercharged 3.0L V6 engine paired with an efficient 8-speed automatic transmission, this is a “must drive” for driving enthusiasts. Enjoy best-in-class standard and premium luxury features including premium 11-speaker 380W Meridian sound system, Cold Climate Package (includes everything from heated windshield to heated seats), Vision Package, Latte leather seats, Reverse Traffic Detection, Brake Assist, power moonroof, 18-inch Templar 5 twin-spoke alloy wheels, and much more! Get peace of mind when you buy Approved Certified Pre-Owned from Jaguar Colorado Springs! This elegant 2017 Jaguar XE35t Premium has passed a comprehensive 165 multi-point inspection and comes with a 6-yr/100,000-mile limited warranty, 24/7 roadside assistance, and more amazing Approved CPO benefits! 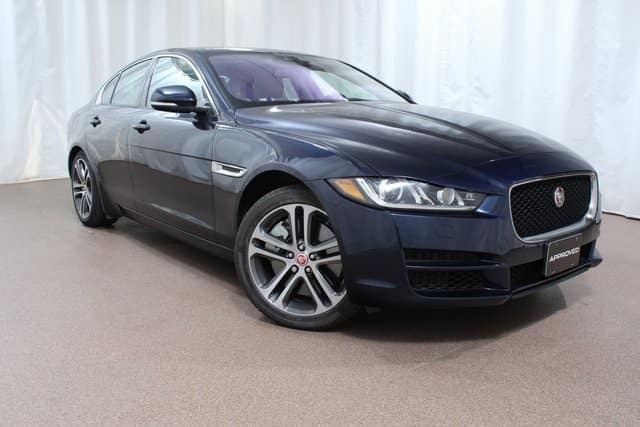 Contact our sales team at Jaguar Colorado Springs for more information on this beautiful luxury Jaguar sedan today!